I just a-d-o-r-e wide brim floppy hats. Floppy hats add a bit of sophistication to any outfit. It can add a pop of color or can add an little something extra to your over-all look. I like floppy hats that have a vintage feel but with a modern take to them. You can't help but feel classy and regal in a floppy hat especially when you pair your look with a fur piece. Just be careful with the extra floppy hats....since some of the wide brim hats are flimsy and tend to flop over your face leaving you blindly walking around. Which tends to happen to me wit my hat from H&M. What do you think of the wide brim hat trend? they are amazing! aren;t they??? you have such a great blog i'd loved it if we followed each other!!!! 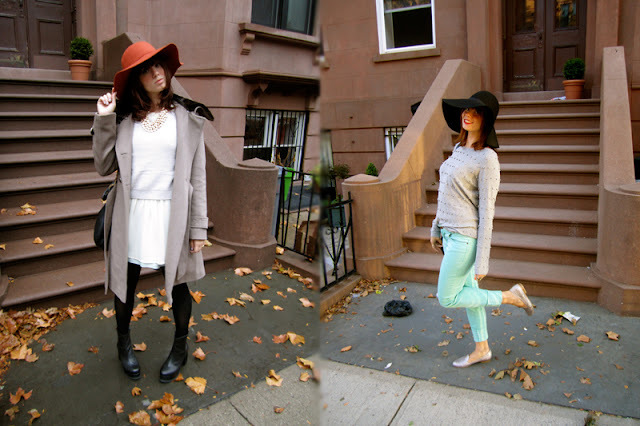 Love floppy hats and I love your two outfits with them! I absolutely love a floppy wool hat or fedora as an alternative to a chunky beanie in the winter. You look great, and the hat on the far left of your collage is beautiful! I love hats in general, but right now a floppy hat is topping my wishlist. I like to wearing a nice hat. I love of hats that's wearing a cute and lovely girls. VERY.COM LAUNCHES IN THE US!